HAI’s firmware update brings added features and expanded connectivity to the Omni and Lumina systems. This pool is open year-round thanks to a motorized roof and home control. HAI's Version 2.15 controller firmware for its Omni and Lumina home control systems offer more audio support and other enhancements. HAI’s Version 2.15 controller firmware for its Omni and Lumina home control systems offer more audio support and other enhancements. A poker aficionado mixes cards and movies in the same recreation space. InVoca’s 3.0 voice-activated IR remote may be the latest in TV remotes, but can it prove to be an effective voice-recognition device? A room-within-a-room construction technique allows this theater to "float" within its home. A room-within-a-room construction technique allows this theater to “float” within its home. Automation Vista's HomeZIX software can now be controlled through SMS and Yahoo Messenger. Automation Vista’s HomeZIX software can now be controlled through SMS and Yahoo Messenger. Home automation manufacturer Control4 has upgraded its warranty against defects from 12 months to 24 months. 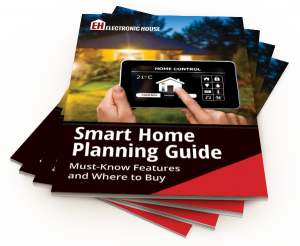 Download our FREE Guides to help you better plan for integrating the products and technologies you see on Electronic House into your own home.